Last time I took a look at team shooting percentage and came to the conclusion that it isn’t a repeatable skill, regressing >60% towards the mean over consecutive seasons. This time I’m going to look at team save percentage in the same manner. When I initially looked at save percentage I found that all teams stop a similar proportion of shots. The best teams in the league have an average sv% of ~80%, whilst the worst teams average ~77%. I also determined that the standard deviation was ~4%, very similar to that of sh%. I’m now going to move on and quantify how much sv% regresses to the mean over consecutive seasons. From this we can determine how much of the variation from the mean is luck and how much is skill. Below I’ve plotted sv% in ‘year 1’ against sh% in ‘year 2’. The R2 value is a mere 0.098, even less than for sh%. 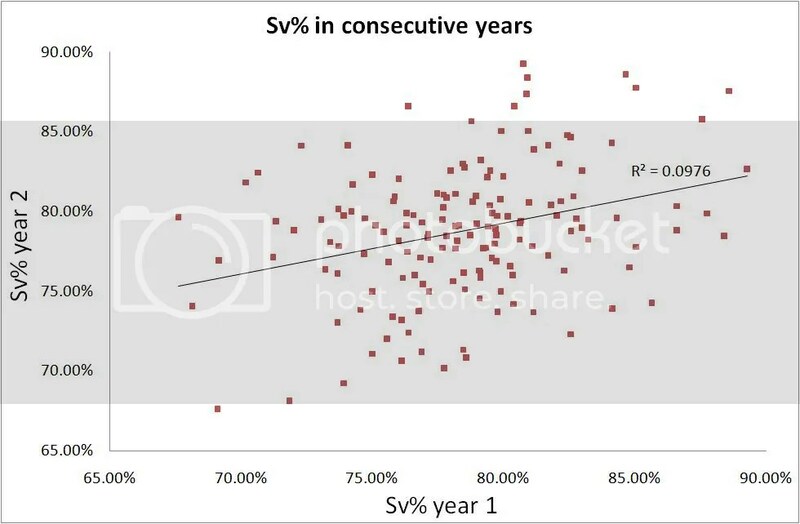 This means that sv% regresses ~69% to the mean from one season to the next. Last time I concluded that team shooting percentage was massively dependent on luck. Well it turns out that luck is an even larger component when it comes to sv% and how a team performs in one season has very little predictive value for performance in the following season.